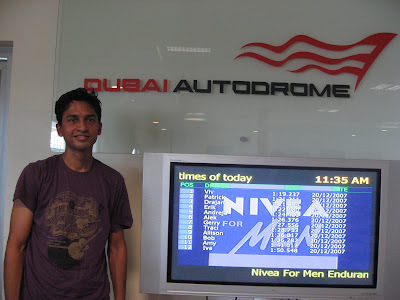 Ever since Viv had landed at Dubai, he had been researching the car racing and go-karting scene. 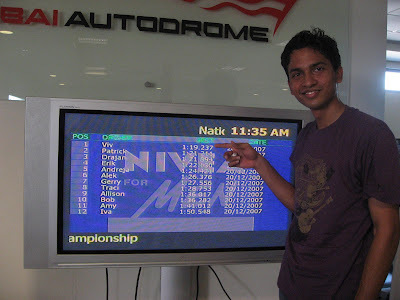 In fact, he was utterly disappointed that we did not go karting on day 1 itself and went to a mall instead. (Ironically, he was the one who came back with the shopping bags!) So you can imagine his utter delight when karting was placed on day 2 of our itinerary. Early on the morning of the 20th, we were off to the Dubai autodrome, an FIA-sanctioned 5.39-km motorsports circuit which was opened in 2004 and which hosted the December 2005 A1 GrandPrix. We were worried about getting there, but we found a cab driver who was adventurous enough to take us on even though he did not know where the place was! A note about cabbies in Dubai - they're all from Pakistan or India so it's perfectly normal to hop into a cab and start talking to the cabbie in hindi/urdu. In all our days and mutitude of cab rides in Dubai, we were never in a cab where the cabbie did not speak hindi/urdu. Even their radios were always set to hindi movie songs! So this cabbie called up a friend of his to ask for directions to the autodrome. Finally we see signs that we were in the right area. However, we still could not find the actual karting circuit for about ten minutes and went round and round a couple of times. Luckily, one of the construction workers in the area pointed us in the right direction. A fancy car we spotted just outside the circuit. Dubai has many racing fanatics and it's common for people to bring their own cars and race in the ciruit. The place was literally in the middle of nowhere, and so we requested our cabbie if he could wait for us and take us back. "Koi mushkil nahin ji!" ("No problem at all!") said the friendly Pakistani cabbie. Awesome. Viv literally jumped out of the cab like a jack in the box and headed straight for the registration counter. As we waited for Viv, I clicked some random pictures. They provided Viv with the karting gear - the body suit, the gloves and the helmet. R, A and I had climbed to the top of the viewing platform to cheer him on. We yelled and hooted but after a few laps when the whole thing got a bit repetitive for the rest of us, we started taking random shots. A took this shot of R and me. But our faithful cabbie showed his support for Viv by turning up at the viewing platform! R took this awesome photo, where he got both the static me and the speeding Viv in the same shot! About 15 minutes later, the checkered flag was waved at Viv. The moment he got out of his kart, he said what all of us, perhaps even the cabbie, knew he was gonna say. "I want to go again!" Basically, he figured it was not much fun to kart by himself, and wanted to get into the competitive round with all the other racers. The other racers looked extremely professional and some even had their own suits! There were two hot chicks in the group too. So we turned to our cabbie and told him he could go off if he wanted to. "Koi mushkil nahin ji!" He said again, and insisted on waiting. Best cabbie ever! Viv gets in position along with his competitors. This was definitely more exciting than the last round even for us, the supporters. We kept our cameras trained on Viv and he seemed to be doing quite well. Before the first lap was over, he was leading, and I actually wondered if there was a possibility of him winning it. And boy, win he did! YEAY! We followed him inside and they gave him a certificate listing his lap times. 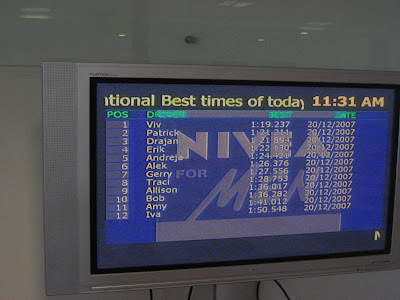 There was a big TV screen inside showing the race results. National best times of today - Viv comes out tops! We forced him into posing like this, pointing to his name! Ah, this is a more complete picture, with the words Dubai autodrome clearly visible. This was taken by my friend R with his fancy DSLR. As we left the place, I caught sight of this little one starting off on his scooter on his own parallel 'circuit'. Catch 'em young eh? "Race kar liya jee bharkar?" ("Raced to your heart's content?") asked the cabbie, while Viv just couldn't stop grinning. Man, does he love driving or what. We headed off to the Dubai Internet City to have lunch near R's office. But due to Eid, it was closed so we decided to go home and order lunch from Nandos. While walking around looking for a cab to take us home, I spotted this. Dewa water! Holy water? Nope, Dewa actually stands for Dubai Electricity and Water Authority. I was so surprised by this Jet Airways ad. 99 Dirhams to Mumbai? Yeah, right! Where's the damn asterisk? Not sure what this building is called - we just called it the watermelon building, because the top resembled a carved watermelon. Coming up next - Ibn Battuta mall, a unique mall named after the 14th century explorer.